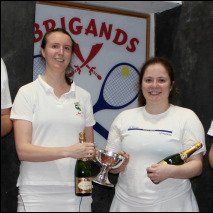 On Saturday 1st of October Holyport Real Tennis Club hosted the annual Tabley Vase ladies' handicap doubles tournament. 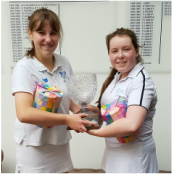 Congratulations to Amy Pye and Hannah Lucey from Prested who defeated Pam Tomalin and Candida Nicholls 8/4 in the final. This was the third year in a row for Amy and the second year for Hannah as well deserved winners of this trophy. There was a slightly reduced number of entries this year as the date coincided with some other real tennis events, however it was a lovely opportunity to welcome some new players on court for their first tournament. All the new players improved as the day went on and we hope to see them again at future ladies tournaments. Thank you from all the players to Jill Newby for organising such an enjoyable day and for providing a delicious lunch. For the second year running this tournament was won by the LRTA team. Congratulations to Izzy Candy and Evelyn Fleming. 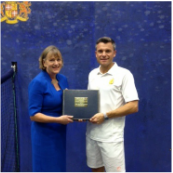 The Wellington Real Tennis Court Opening Ceremony took place on Wednesday 21st of September. HRH The Earl of Wessex unveiled a plaque and after a tour of the new facilities there was an exhibition doubles match between Claire Fahey & William Maltby v Freddie Bristowe and Dan Jones. The former won 6-5 (reaching deuces in the final game). After the match Katy Weston presented a hand made leather bound Match Book to William Maltby on behalf of the LRTA. There are many photos of the official opening ceremony on the T&RA website. Click here to go to the page. To celebrate the opening of the new real tennis court there was a celebratory weekend of tennis and social events from 23rd to 25th September 2016. This included a Handicap Doubles Tournament, Cocktail Party and Black Tie Dinner. For photos of the Black Tie Dinner on the T&RA website Click here. It is with great sadness that we report the death of Melvyn Pignon. Melvyn was well known as a hockey player, representing England from 1954 to 1967. However she was also a Real Tennis player and served on the LRTA Executive Committee for many years. Melvyn first started Tennis when journalists were offered to try the game at Queen's and she won a racket for being the most promising player. Her funeral took place on Thursday 29th September 2016 at 1pm at St Mary's Church Sunbury. Click here to read the obituary published in "The Times" on 17th September.